As seen on 20/20. It was an amazing story! It should be "The Picture of the Year," or perhaps, "The Picture of the Decade." The picture is that of a 21-week-old unborn baby named Samuel Alexander Armas, who is being operated on by a surgeon named Joseph Bruner. The baby was diagnosed with spina bifida and would not survive if removed from the mother's womb. Little Samuel's mother, Julie Armas, is an obstetrics nurse in Atlanta. She knew of Dr. Bruner's remarkable surgical procedure. Practicing at Vanderbilt University Medical Center in Nashville, he performs these special operations while the baby is still in the womb. 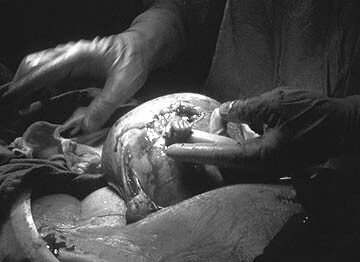 In the procedure, a C-section removes the uterus and the doctor makes a small incision to operate on the baby. During the surgery on little Samuel, the little guy reached his tiny, but fully developed, hand through the incision and firmly grasped the surgeon's finger. The photograph captures this amazing event with perfect clarity. The editors titled the picture, "Hand of Hope." The text explaining the picture begins, "The tiny hand of 21-week-old fetus Samuel Alexander Armas emerges from the mother's uterus to grasp the finger of Dr. Joseph Bruner as if thanking the doctor for the gift of life." That picture is graphic reminder that growing in the womb of his or her mother is a baby. It is not a "glob of tissue," or "product of conception." That pre-born baby is a human being with all the emotions, will and personality of any human being. That picture says it in a way that a thousand words cannot. Little Samuel's mother said they "wept for days" when they saw the picture. She said, "The photo reminds us my pregnancy isn't about disability or illness, it's about a little person." That's what it's always been about.